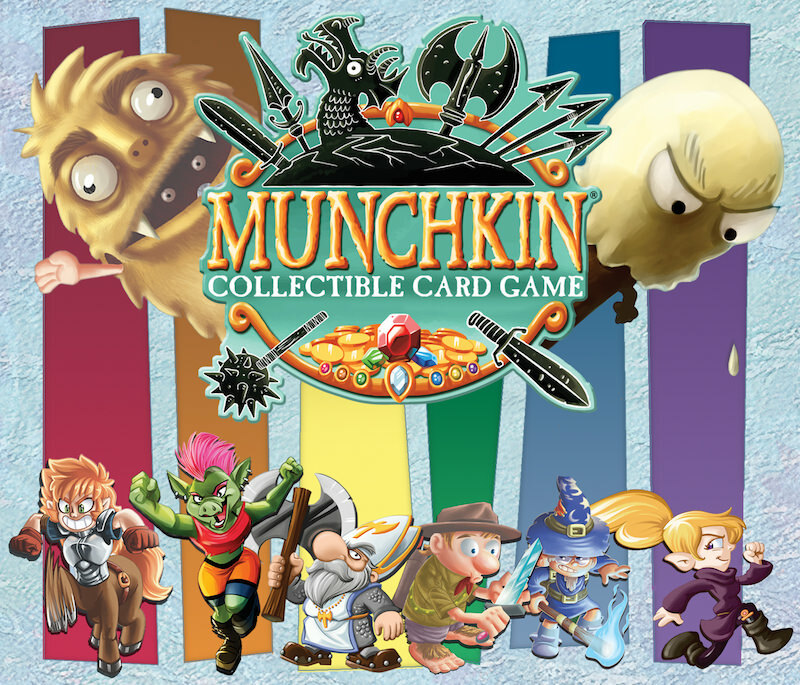 MUNCHKIN COLLECTIBLE CARD GAEM !?!? Eric Lang and Kevin Wilson deliver a completely new design in the Munchkin universe: a stand-alone, two-player collectible card game that holds up to competitive-level play but still retains the goofy silliness for which Munchkin is famous. Munchkin Collectible Card Game is a combat game in which 2-4 players level up turn after turn, put loot into play to give themselves benefits, and attack (or bluff attacks!) against one another. Eliminate the other player first, and you win! In the words of co-designer Eric Lang, "'[Munchkin Collectible Card Game] is a very different game from Munchkin. Imagine all the awesome humor of Munchkin as a short, competitive head-to-head slugfest." The card game will be distributed as fixed two-player starter sets and randomized booster expansions.